Turkey will not take a step back from its operation against the PKK-linked People's Protection Units (YPG) in Syria's Afrin, President Recep Tayyip Erdoğan said Monday, as Operation Olive Grove entered its third day. "We are determined. Afrin will be sorted out. We will take no step back. We spoke about this with our Russian friends. We have an agreement," Erdoğan told a televised meeting in Ankara. Erdoğan confirmed that Turkey had spoken with other powers, including the United States, about the operation but admitted: "we couldn't convince the U.S. of some things." He did not give further details. "We as Turkey have no intention to occupy anywhere. We have a single goal -- to win hearts," said Erdoğan. 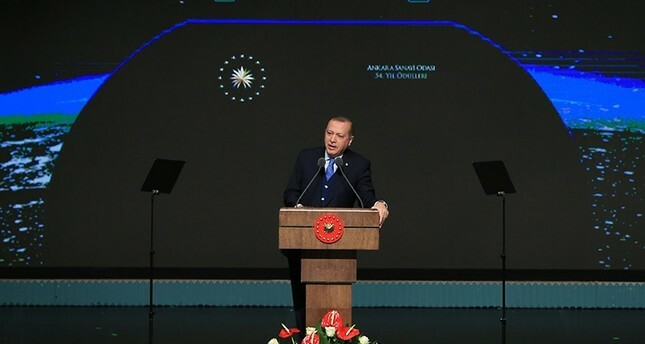 Erdoğan said the operation would be over "when the target is achieved." "How long have you been in Afghanistan? Is that over in Iraq?" he said, referring to the current U.S. military presence in those countries which began with 2001 and 2003 invasions. "There is no maths in such a war. How dare you ask us? We will stay as long as we need, we have no interest in staying there, we know when we will leave." The Operation Olive Branch has been launched in Syria's northwestern Afrin region to clear terrorist groups such as the PKK and its affiliates KCK, PYD, YPG; and Daesh. While ground troops located in Kilis province near the Syrian border aim at PKK/PYD targets with howitzers, tank units, multiple rocket launchers, Turkish warplanes target previously identified terrorists in an air operation.